My son is getting ready to graduate from HS. I am trying to figure out what to do with the 54 gallons of Legos (three 18 gallon bins full) that have been sitting unused in his closet for the past couple of years. See list below. The pieces are all mixed up, all different kinds. There are some instructions manuals intact but not a lot. There were big sets and little sets and who knows what else. Bazillions of minifigs. No boxes. Might be a few bionicle containers but that's all. I do not have a lot of time and energy to go through and sort these out and I wouldn't know what goes with what most of the time. My son is not interested in sorting the pieces because he thinks it's not worth it and we should just give them away. I know they are worth some money but I have no idea how much and at what point it makes sense to sort or not sort the stuff. I would love some advice on the most sensible way to approach this problem. Lego sets date from 1998 or 1999 through 2008 or 2009. I've listed the set types I know for sure are there. There are a lot more bricks from the themes at the top of the list and maybe only one or two by the time you get to the bottom. And I have probably missed a theme or two. Keep it until he comes out of his Dark Ages. Yes well, if I knew for sure that day would come I might try to figure out how to store them until then. I know he thinks they aren't worth anything but I can only imagine what they are worth now let alone 10 or 20 years from now. But he was not much into building the sets the way they were designed. He mixed everything with everything and never left anything complete for more than a couple hours once he had finished it. Even when he was only 4. Sometimes you just have to let things find a new home with someone who appreciates it now. Personally, I would keep them until he wants them back in about 5-10 years. But if your heart is intent on getting rid of them, Ebay is your best option. You won't have to sort them and you'll get a fair price for them in the condition they are in. If you want the most money for them, tell him to put all of the sets back together with the instructions and sell them that way. Yes, they are worth money,if nothing else, you can sell them by the pound, look at ebay listings selling Lego by the pound. Is t worth sorting them? Maybe, depends on what is there and what your time is worth. If he doesn't see value there, this is a good chance to teach him a life lesson. Sort and sell them, make a few thousand dollars, and keep every penny for yourself, pointing out to him that he saw no value there. If we sorted out the Bionicles would those be worth assembling the individual ones and selling them? My son says he could probably do that and he had 60+ Bionicle figures large and small. The same with the minifigs and minifig accessories like guns? Otherwise sorting everything just seems too overwhelming to him. 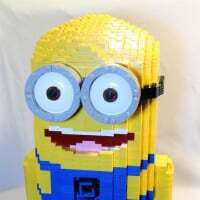 I looked at e-bay and a lot of the Lego things didn't have anyone bidding on them so it made it hard for me to know if the pricing was comparable. ^^ As a general rule, Bionicle sets don't tend to be worth much. As for minifigs, especially if you're planning on selling it all in a bulk lot, it might be worth it to pull out at least some of them to sell separately. But if you really want to sell, I suggest sorting out the parts by size or colour and putting them on Craigslist or eBay. Yes, I agree about regretting selling them in the future. But the money will help pay for his books at community college next year and for driver's ed and things like that. Provided I can figure out how to strike a balance between selling in bulk and selling sorted parts. I would take the Bionicle parts out of the lot. They tend to bring the value of bulk lots down. Sell the Bionicle parts separately. @54gallonsbricks4sale- Could you take a few pictures of the lot? I realize that it is very large, but perhaps spread the pieces across a white sheet/blanket and snap a few photos. That way the members of this forum, myself included, can see at least some of the contents and let you know what value it may hold. If there are any rare gems of sets in there, it'd be worth it to take photos and find out. I would hate to see you sell it for $7 a pound, and have a gem hiding beneath the bulk. In this case, pictures will give a description better than words can. I live in central ca too, and I'm interested. I'll pm you. Agree with @samiam391. Take some photos and post them. Don't rush yourself in selling them without first getting opinions on the value of what you have. Sure, it might be easier to sell local, but you would likely lose money by excluding those not local. 3 bins is not a lot, store em in a corner of the basement. What ever you decide good luck! Believe or not, not everyone comes out of a dark age. I think almost every child has lego of some description at some point, but how many of them become AFOLs when they're older? An easy way to see what you might have is to pull out all the minifigs. That should tell you what sets you might have lurking amongst the bricks. Or give up a photo and let the forum do the detective work. That should tell you whether you have any sets worth piecing together, or even just have any figs worth selling on their own. Your kid will one day have kids and you will regret getting rid of it all, maybe keep one tub full? Man, there must be blood on the water. Anyone who had that much LEGO as a kid will come back to LEGO one day. For me, it happened after my son was born. Unfortunately for me, my mom had decided to sell my LEGO sets years ago, so I had to start from zero on rebuilding a collection. My wife and I have talked about it, and LEGO sets are one thing we will never get rid of. Some day we hope to have grandkids, and since today's LEGO bricks are 100% backward compatible with LEGO sets from when we were kids, at the very least we'll have LEGO for our grandkids to play with some day. Personally, I plan to keep on playing and building with them long after my kids have entered a dark age (assuming they do), so these LEGO bricks won't have a chance to sit and collect dust. You might get some cash now if you sell, but it will be pennies on the dollar if you are selling in bulk lots compared to what the sets would be worth. While in the short term you'd get some cash, in the long run you'd be losing money not making money. Post some detailed pictures and we can give better direction. If you do sell, then list on craigslist as a complete childhood collection. You should be able to demand close to $10 a pound if you have decent sets and the blocks are in good condition. What @andhe said - spot on. We're a massively skewed sample - of course we all think that everyone comes out of their dark ages because we all did - but in reality I'm sure most kids probably don't (I'll whisper it, but i think we're all a little unusual!) LEGO is after all a kids toy. Definitely post some pictures and you'll get some decent feedback from the good members here about any valuable sets that might be lurking in those bins. If there are then it will be worth sorting those, if not sell 'um cheap. OP, did you really make your forum name based on this one topic?